If your company is like most, it is becoming increasingly dependent on your software applications and electronic documents to conduct business. Yet, there are so many disasters that can make your data inaccessible to you. From natural disasters such as fires and floods to technology malfunctions such as a server crash or a UPS battery failure, these disasters can cause your business extensive data loss and costly downtime. Less obvious causes of downtime are the data loss caused by human error and malicious intent, and increasingly by cyber security threats. Your business needs to protect your critical applications and sensitive information. 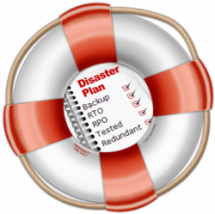 IT Disaster Planning is an essential element of a Business Continuity Plan. As reported by FEMA, 25% of businesses do not reopen after a natural disaster and 43% do not re-open after catastrophic data loss. Preparing for a disaster is one of the ways that your business can protect your business data. It is impossible to predict when a disaster will strike, but having a complete Backup Disaster Recovery Plan (BDR) will offset the time and expense involved in its preparation, as well as increase the chance that your business will pull through and survive the disaster. How long would it take your business to recover from a disaster? Work with your IT provider to determine the optimal combination of Recovery Time Objective (RTO) – the time it will take to restore business processes – and Recovery Point Objective (RPO) – the amount of data that it is acceptable for you to lose from the time of the last backup. Confirm that your solution backs up your entire system including not just your files, but also your programs and the operating system. Ask your IT provider if they test backups to ensure that your entire system can be quickly restored. Also ask if they will be able to locate specific lost files and identify application changes between any two backup points to restore just the affected files, in the event that only a few files are deleted in error or are affected by a virus. In addition to ensuring that your systems are backed-up and restorable, ask your IT provider if they incorporate redundancy in your system to minimize the possibility of downtime and data loss in the event of an IT malfunction. An example of a redundant solution is a hybrid system that backs up both locally and in the cloud. Confirm that your system is optimized through maintenance, updates and patches. Ask if your IT provider proactively monitors your systems to ensure that your business operations remain up and running. In some industries, such as healthcare, protecting sensitive client information is required by government regulations. In others such as law, protecting it is required by a relationship based on trust. In addition to protecting your data from loss, protecting it from inappropriate access is an essential element of keeping the data private and secure. Access controls need to be put into place to ensure that your employees view only the applications and data they need access to, based on their job functions. As part of your disaster plan, this not only helps to prevent an unauthorized breach of sensitive data, but it also limits the vulnerability of your network to malware that is inadvertently introduced by those employees. Big Idea Technology is here to help! The executive team at Big Idea Technology has over 40 years of combined experience implementing solutions to protect our clients’ data. When you meet with your account manager at Big Idea, we’ll discuss your key business applications and where your data is stored. We’ll work with you to prepare a security assessment and make the necessary changes to secure your systems and your data. Contact us to discuss how our IT Disaster Planning solutions will protect your data and help your business recover after a disaster.